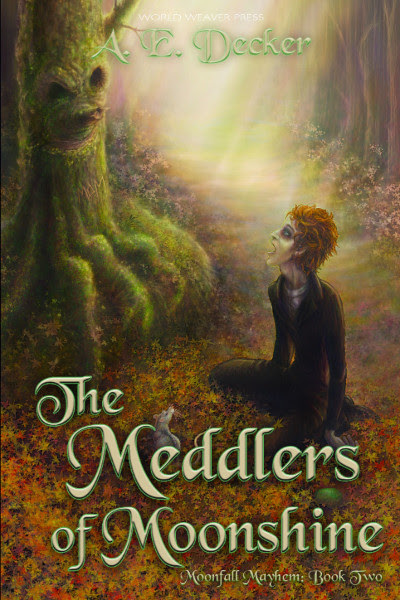 Albuquerque, NM (Octobert 25, 2016) – World Weaver Press has announced The Meddlers of Moonshine, the upcoming fantasy novel by A. E. Decker, and second book in the Moonfall Mayhem series, is available today, October 25, 2016. Something is rotten in the town of Widget, and Rags-n-Bones knows it's all his fault. In book one, The Falling of the Moon, Ascot Abberdorf left her home in Shadowvale to find True Love and a Happily Ever After, and instead discovered that it is often wiser to write your own story than to follow another. Now traveling with a ragtag quartet of friends, Ascot heads to the sleepy-seeming town of Widget that has tales of its own to tell. No sooner has she arrived than Ascot finds herself the foremost investigator hired to rid Widget of the ghosts plaguing its streets. While Ascot hunts spooks, her companion, Rags-n-Bones, discovers old friends and adversaries from a past he completely forgot he had. Are his lost memories connected to Widget's present woes? He's sure he could find out, if people would just stop locking him up. Someone's meddling with Widget, and it's up to Ascot and Rags-n-Bones to discover who, before the town consigns itself to the graveyard of history! The Meddlers of Moonshine follows Decker’s 2015 release The Falling of the Moon as the second book in the Moonfall Mayhem series. The Meddlers of Moonshine is available in trade paperback and ebook via Amazon.com, Barnesandnoble.com, Kobo, iTunes, and World Weaver Press, and for wholesale through Ingram. "I give The Meddlers of Moonshine five delicious avocados. The story is as tasty as the fruity treat. I devoured it all and I am hungry for more." "This was a good fantasy story...you can bet I'll be watching for the next book in this series."